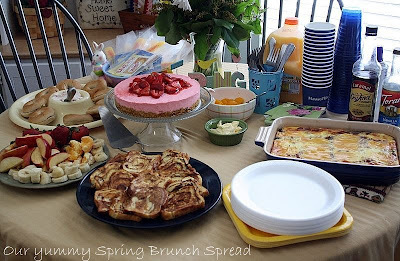 Mommy's Kitchen - Recipes From my Texas Kitchen: Velveeta Cheesy Bacon Hash Brown Bake "Spring into Brunch"
Velveeta Cheesy Bacon Hash Brown Bake "Spring into Brunch"
Hi everyone last weekend I hosted a wonderful "Spring into Brunch" House party at my home. The weather in Texas was definitely not spring like with the unexpected 3 inches of snow we received. So our guest list was limited due to the weather, plus it was also Spring Break. With all of that we still made the best of it and had a great time. Y'all may remember back in January I mentioned that I have partnered up again for 2010 with VELVEETA to serve as one of five Velveeta it Kitchenista's. Every couple months each kitchenista will be sharing vlogs on all sorts of different holidays. 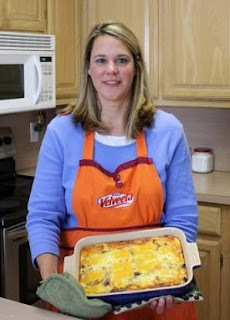 All of us will be whipping up a yummy Velveeta inspired recipe and vlogging about our experience. Today I am sharing with y'all the Velveeta Cheesy Bacon Hash Brown Bake that I prepared and served at my brunch. It was so good and cheesy that I know I will be making this dish again. Also be on the look out later this week, because I will be sharing the recipe for that beautiful No Bake Strawberry Cheese Cake pictured below. I hope everyone enjoys the video and the recipe. For my email subscribers you will have to click here and it will take you directly to Mommy's Kitchen to view the video. We had lots of great food at our spring brunch. Everyone demolished the Velveeta Cheesy Bacon Hash Brown Bake and I was left with an empty pan. That should be proof of it's yumminess. Don't forget to stop by Velveeta's Face book page. Where you can follow along all this week and see videos from my fellow Kitchenistas and see what yummy cheesy dish they will be preparing. For more great ways to Velveeta It! visit Velveeta.com . HEAT oven to 350ºF. COOK bacon in large skillet on medium heat 10 min. or until crisp, stirring occasionally. Remove bacon from skillet, reserving 2 Tbsp. drippings in skillet. Drain bacon on paper towels. Meanwhile, add potatoes, mushrooms, peppers and onions to drippings; cook 10 min. or until peppers and onions are crisp-tender, stirring occasionally. SPREAD vegetable mixture onto bottom of 13x9-inch baking dish sprayed with cooking spray. Whisk eggs and sour cream until well blended; pour over vegetable mixture. Top with bacon and VELVEETA. BAKE 40 min. or until center is set and casserole is heated through. Disclosure: I have partnered with VELVEETA to serve as one of five VELVEETA it! Kitchenistas. I have been compensated for my time commitment to the program, which includes vlogging about my cooking experiences with VELVEETA and developing one original VELVEETA-based recipe. I have also been compensated for the food purchased for my VELVEETA vlogs. However, my opinions are entirely my own and I have not been paid to publish positive comments. Cause that's just wrong. Email Subscriber. Click here to sign up. Tina this sounds so delicious!! I'll be giving it a try for sure! Have a Happy Easter!! Tina, that was awesome! Great job on the video! Velveeta, bacon and hashbrowns...you really can't go wrong with that combination, can you? YUM! Tina, we made this for breakfast yesterday and it was so delicious! Thank you for the recipe! I found your blog through Blog Frog. LOVE IT! I have to try this recipe. I am now following. I made this for our Easter brunch. It was a HUGE hit! My hubby said it's his favorite breakfast casserole and he wants me to make it often. My boys loved it too, even with the peppers, which they usually avoid like the plague! Thanks for another great recipe!!! My daughter and I made 2 of these for Church Fellowship. We made one with the bacon and the other we used ground sausage. Both were a huge hit! Thank you for sharing! Your brunch table looks wonderful!!!!!!!!!! All the food at your brunch looks beautiful! Yum.